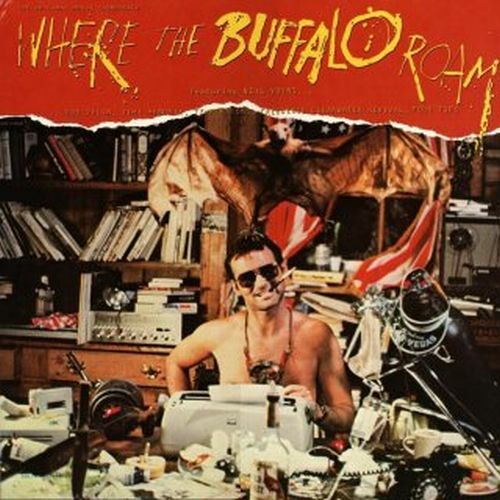 Listen, I’m not here to defend the original feature film based on the writings of Hunter S. Thompson entitled Where The Buffalo Roam (1980)…oh wait, yes I am, but I’ll be brief. The movie, typically, gets critically panned every time I hear it brought up in conversation; no matter the context. And I will agree, that yes, when compared to Johnny Depp’s uncanny portrayal of the good Doctor in 1998’s Fear And Loathing In Las Vegas, Where The Buffalo Roam does come off as the red headed stepchild. But, and this is important, know that in Where The Buffalo Roam, that you are watching Bill Murray’s take on BILL MURRAY portraying Hunter S. Thompson…Murray, the comedic genius that he is, never does a straight portrayal of anything. The “Murray” character is always in there, hell, even in The Razor’s Edge, the Bill Murray character is in there stewing. These are two entirely different films, tackling two different “plots.” The Depp vehicle was (obviously) based on Thompson’s bestselling, most popular, written work Fear And Loathing In Las Vegas, while Where The Buffalo Roam is a ramshackle smattering of various HST stories, some of them true, some fiction, with most, appropriately, residing somewhere in the middle. Despite your feelings on the film, Neil Young fans will want to track down the official soundtrack (no small feat), as in addition to various rock, r&b and pop hits from the sixties (Hendrix, Temptations, Dylan, CCR), the film was scored by Young with original works including: “Buffalo Stomp,” “Ode To Wild Bill #1,#2, #3, #4” “Home, Home On The Range,” and “Buffalo Stomp Refrain.” Giddy up. You can actually watch this entire film online, just go to http://www.moviesfoundonline.com/index.php, I watched it the other night…great movie and even better soundtrack! thought i would share btw. Man, I remember watching that on cable as a kid (’81ish), and wanting the soundtrack since then. Thanks for posting that. Thanks for posting these. I wonder if any of this stuff, out of print as it is, will show up in the Archives. Neil also cameo’s in the film as a truck driver. pretty funny. I’ve always liked the film…even more than the Depp take. Hunter was a comedic genius – whether through words or actions. I don’t think Depp captured that entirely. Billy made me laugh more, which is what Hunter is all about – to me anyway. While we are on the topic of Neil Young scores, and, for that matter, Johnny Depp movies, how about a post on Dead Man. That is a very haunting and wonderful, particularly the theme. Ive never managed to get my hands on that one. The partying, uh, small folk in this movie are the best partying small folk ever. So we’ve had Murray and Depp play their takes on Hunter. Who’ll be the next gen young edgy actor to tackle this turf, say in a movie adaptation of “Transmetropolitan”? vote number 2 for Dead Man! You can watch the full movie online for free. See SEE HERE for link. I have been reading HST since I was 14 and I am 31 now. The Bill Murray portrayal is HST. The Johnny depp version is HST alter ego Raul duke. I think Billy’s part is way better for portraying HST the man not the cartoon character. in the scene at the start of the movie, right after he shoots the telefax, what song artist is he listening to when he reloads his gun and continues typing his story.